Right click each link and "Save File As" to download the pdf file of the newsletter to your computer. 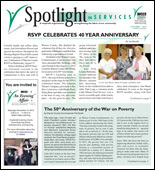 RSVP Celebrates 40 Years, ELC's New School Year, Franklin's Author Renown, Fresh Food For Seniors. 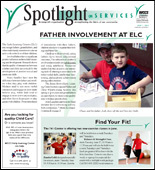 Father Involvement at ELC, See What You've Been Missing, We Need to Talk, Fulfilling Lives With Volunteerism. 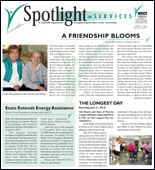 A Friendship Blooms, 741 Center Member Publishes Book, Naturalist Visits Early Learning Center, A Valentine Treat for Seniors. 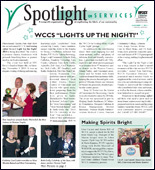 WCCS Lights Up the Night, Making Spirits Bright, ELC Focus on Dental Health, Scribbled Notes Become Book. Click here to be added to our printed newsletter postal mail list.